Marden has always had a good natural water supply, sited as it is on Wealden clay. Water is retained in the soil and the water table is high. There were several pumps and wells in the village. 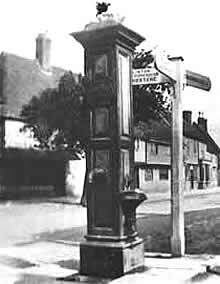 The Parish Pump, pictured here, stood in the centre of the village opposite the Maidstone Road. It was erected by the Parish Council in 1899 when the old dip well was covered in. It has been painted in several colours in its time though the most favoured combination was red and yellow. In 1907 the Parish Pump was locked up by the Rural District Council as it was found to be contaminated by ammonia, nitrates, chlorides and organic matter. It was then removed to the Workhouse well, and can still be seen today in front of the The Allens, which now stands on the site of the Workhouse. It no longer draws water, it is now a decorative item. To this day the Pump is a feature in the village. The Marden Society newsletter, which is circulated regularly to members, is known as “The Parish Pump”.